Here’s a tale of the good old days, when a middle class family— my family—lived well and retired well on a factory worker’s income. It’s a mid-twentieth century story. And it’s so very different from today, that I want to share it. My dad, Leo Trasko, was born in Chicago in 1919, the son of family who had emigrated from Poland the generation before. He and his friends danced to Benny Goodman when his band played in bandshell on the Chicago waterfront. He met his sweetheart Janina, also from a family of Polish immigrants, in a Chicago suburb that everyone called Argo, because so many people in the neighborhood worked in the Argo corn starch plant. 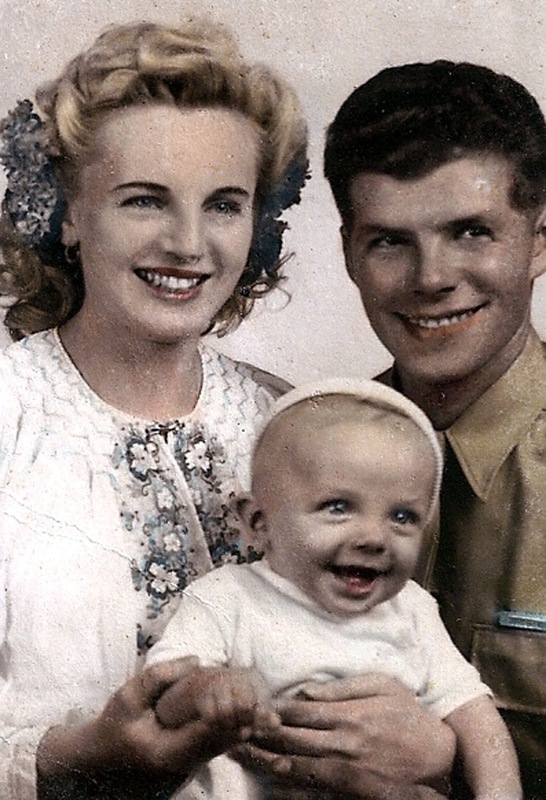 They married in 1943 just before he went into the army, and their son Len was born two years later. Leo had a high school education and he was good at fixing things. 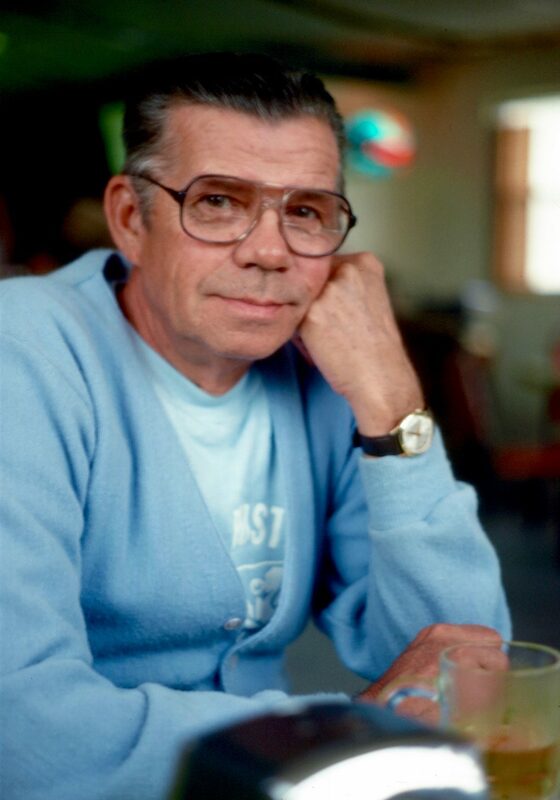 He landed a job at General Motors in the Delco Radio division, the kind of job that in those days was a golden ticket to the good life. 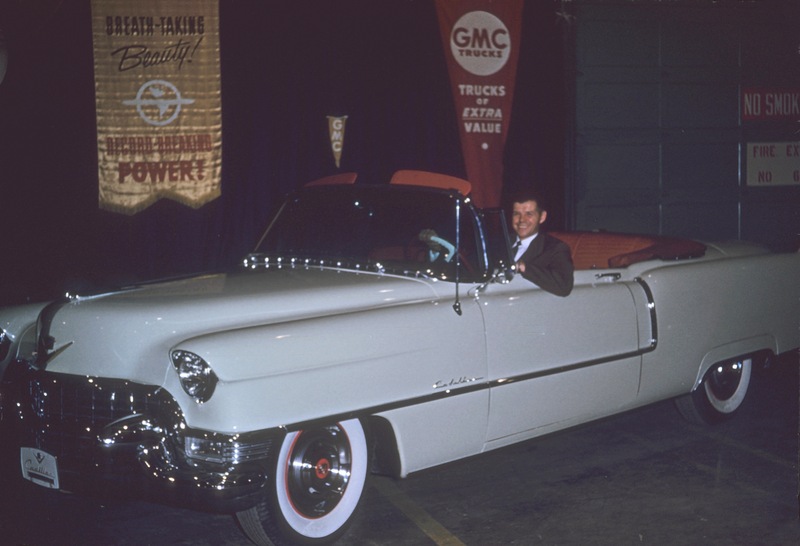 He took great pride in working for General Motors. These photos were taken during a Delco Radio open house, showing the crew he worked with at his plant in the Chicago area. Len behind the wheel of a 1954 Oldsmobile, our family car in Chicago. 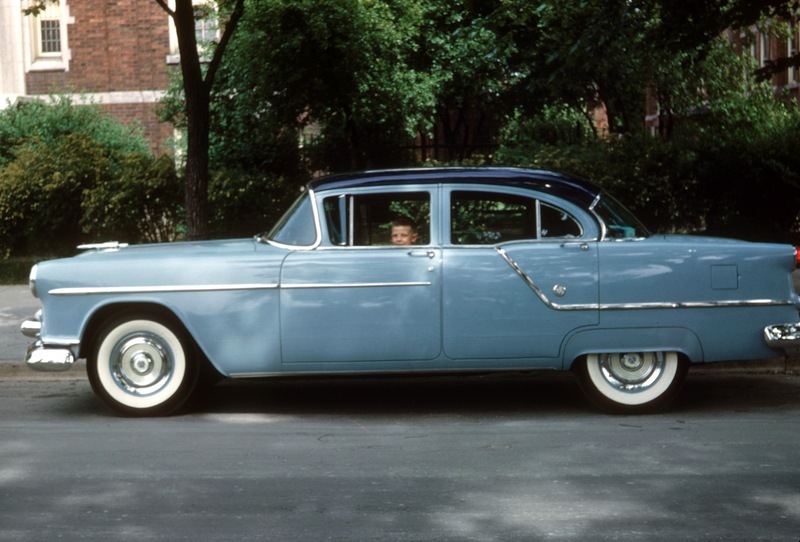 Buick and Chevrolet cars in the late 1950s sold new for around $3000. General Motors had a loyal employee in Leo for decades, one who was paid well enough to purchase a steady stream of GM cars over the years. Like so many other American families, my parents did their best to “see the USA in your Chevrolet.” They traveled all over in the United States taking Len to all the great national parks in the West and visiting nearly every state. 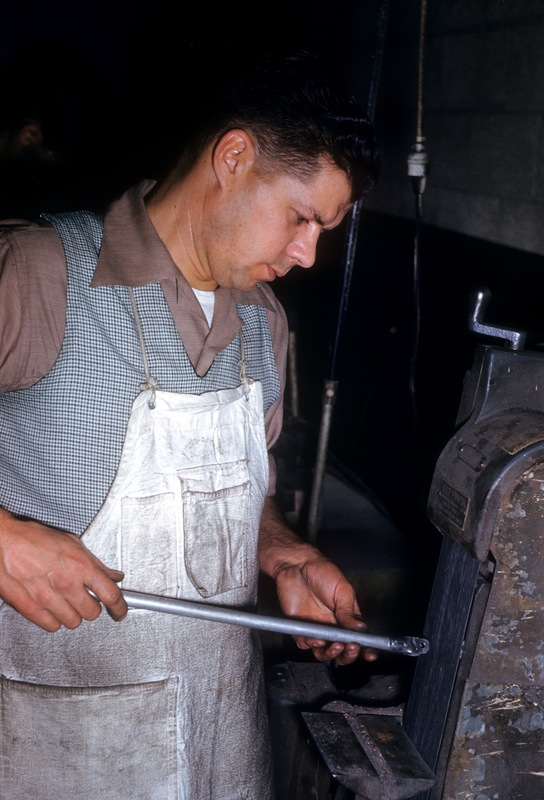 In the early 1960s, a few years after I was born, Dad got the opportunity to move to Kokomo, Indiana and become a Tool and Die Foreman at a new plant for Delco Radio. The auto industry has long heritage in Kokomo beginning in 1894 —when the first car with a combustible motor engine and first pneumatic rubber tire were invented there. 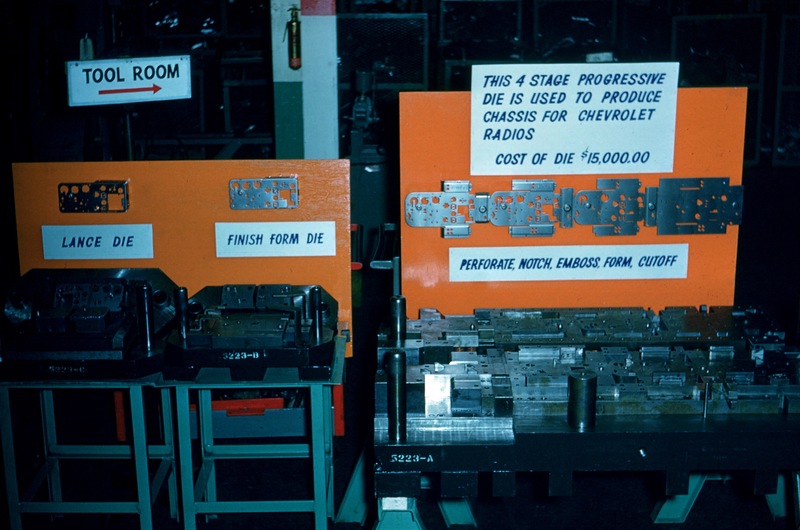 In the late 1950s, not only GM, but Chrysler and Delphi were building plants in Kokomo, too. Leo and Janina built a new house and thrived in Kokomo. His salary afforded for Janina to be a stay at home mom, taking care of the child-rearing and home making. Many of the families in our neighborhood had someone working in the auto industry. These families now seem very lucky, like what some are calling the ‘blue collar aristocrats” of the 1960s and early 1970s. Leo and Janina sent both of their kids to college on his salary. In the 1980s, as he approached age 62, Leo saw the factory culture become tougher, and he was feeling tired. He was fed up with chasing the younger guys in the shop to work. One of his close friends had retired at 65 and died within a year. 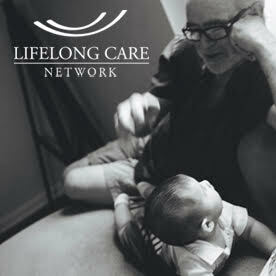 (In those days, the insurance tables planned for men to live 10 years or less after retirement.) He decided to retire at 62, which would mean getting less than the full benefit from Social Security. I was finishing college at the time. He told me they had $60,000 in the bank, which seemed to me not enough to live on for the rest of their lives. It surprised me that they didn’t seem concerned. Dad counted on his pension to take care of them. GM cut benefits to the workers on the shop floor in the 1980s. The workers who had replaced dad were getting far less generous benefits than he had. When dad visited his old plant after he retired, the guys would joke with him, “What, you’re still around! You’re eating up all our benefits, old man!” Dad benefitted greatly from spending his working years in a period where the United Auto Workers, and unions in general, could negotiate from a position of strength. Ronald Reagan came to Kokomo twice in the tough times of the 1980s, telling residents to hang on. The divorce rate in town was high, and so was amphetamine use with so many workers coping with the monotony of the production line. 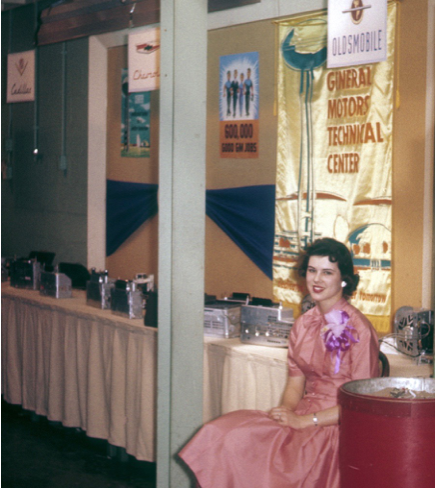 Kokomo was a microcosm of that what going on in many small manufacturing cities. 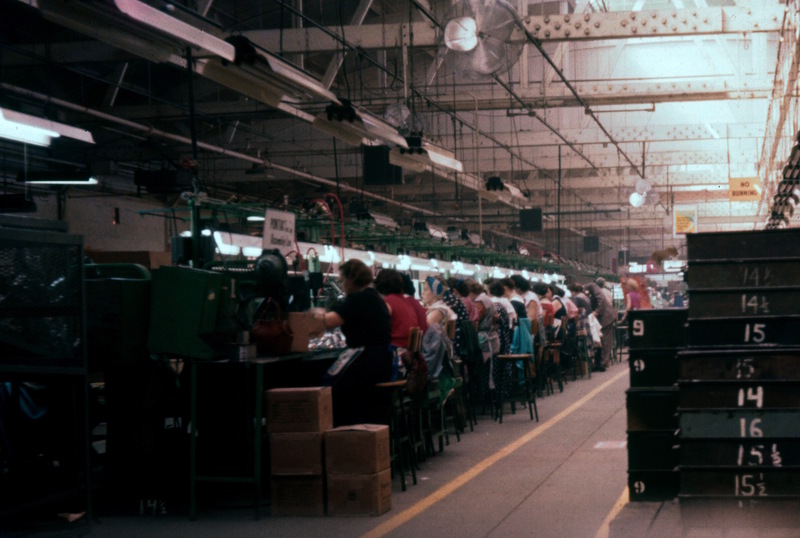 In the1980s, nearly 20% of Americans still worked in manufacturing. 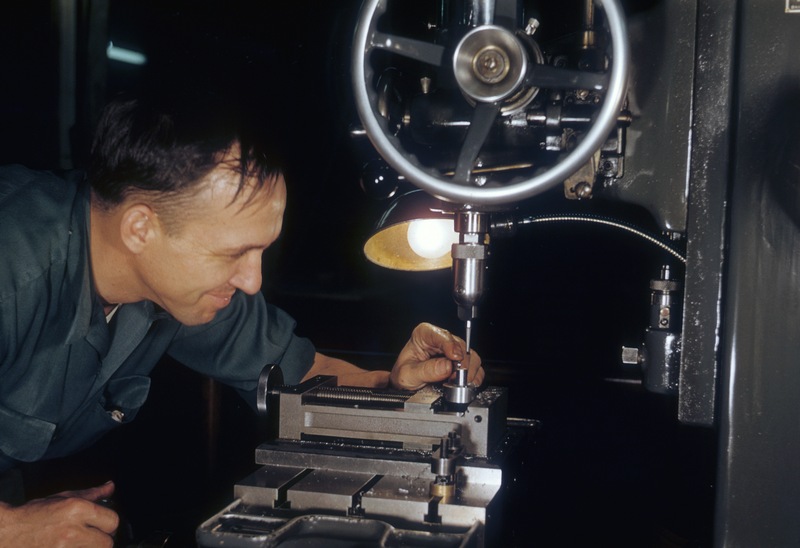 Over the next few decades, U.S. manufacturing would lose more and more jobs in its gradual shift to a service economy. After more than 30 years of work for GM, Leo made his exit from the working world with confidence, knowing that he and Janina had a secure future. In retirement, my parents were happy “snowbirds” who moved each year between Kokomo and a house on Gulf Coast of Florida. He and Janina had more than 20 years of retirement in which they lived off his pension and social security and barely touched their savings. When dad died at 85, they still had their $60,000 in the bank, even though he had taken an early retirement and was getting a reduced Social Security benefit. Dad’s GM benefits covered Janina, as a surviving spouse, until she passed away at 89, at which point they still had their $60,000 nest egg! They had their share of health concerns and hospitalizations over the years, but GM’s excellent health benefits post-retirement covered both of them throughout their lives. I give these details to emphasize the difference that a pension made in securing a retirement future. These days, their $60,000 would be gone in a year or two, let alone last three decades. Mom and dad didn’t live lavishly, but they lived well. He had the feeling that things would be better for his kids, a situation that today seems thrown in reverse. It all seems worlds away from the life of an auto worker today, as Bloomberg reported in their cover story on “The New Detroit” where pay is low, safety is an afterthought, and a factory job is no longer a ticket to the middle class. Today, not only are manufacturing jobs less secure, but key segments of the service economy, like retail jobs, are looking unstable, too. My parent’s experience of a secure middle class retirement used to the norm for millions of Americans. Sadly, this experience is fading from our collective memory. And the lack of good employment options in mid-life, before retirement, is preventing a significant portion of the population from saving for the future. Without pensions and with cuts proposed to social security benefits, what will retirement look like in the coming decades? In the next post in the retirement section, I will write about the ‘new landscape’ of retirement, as we and our friends are experiencing it. 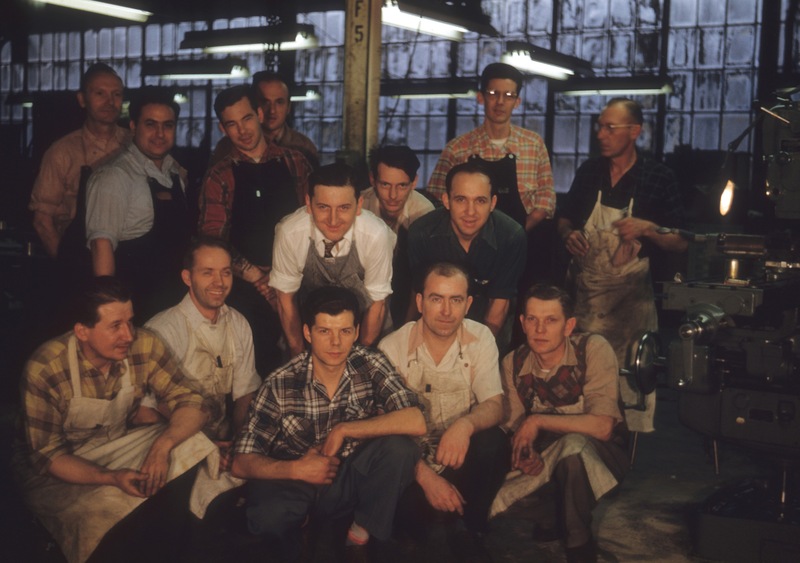 See below for more of Dad’s photos from Delco Radio in the glory days of American manufacturing. 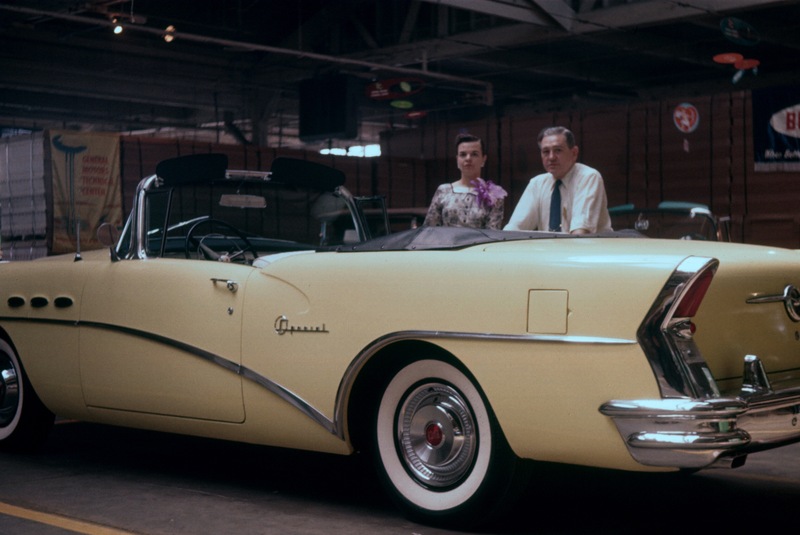 At the factory Open House, workers with a 1956 Buick Special, one of the “sexiest 1950s cars ever made,” according to Mike Timko of the 55-57 Chevy Restorers Facebook group. This is an amazing article and I love the terrific photos. This really was the American dream. Corporate raiding and a lack of new skill job training seems to have made the situation worse. Keep up these great articles! Thank you, Nataly. My parents really enjoyed their retirement. We’re working hard to enjoy ours as well.